As an English-speaking person who moved to Montréal last year, I have been fascinated by how the French and English cultures co-exist. People here speak both languages fluently and, in fact, will switch from one to the other within a conversation – sometimes in the same sentence. The day-to-day can be both fascinating and frustrating as a new resident navigating my way through traffic and street signs in French, the metro (subway & bus system), and speaking with the Quebecois to get a bagel or buy a mattress. When asked to compare social media communications of two different organisations in the same industry, I jumped at the chance to compare the colleges of Montréal because they serve specifically English-speaking students or French. They also work to bridge the gap and point students to the world around them. So this is what I observed. 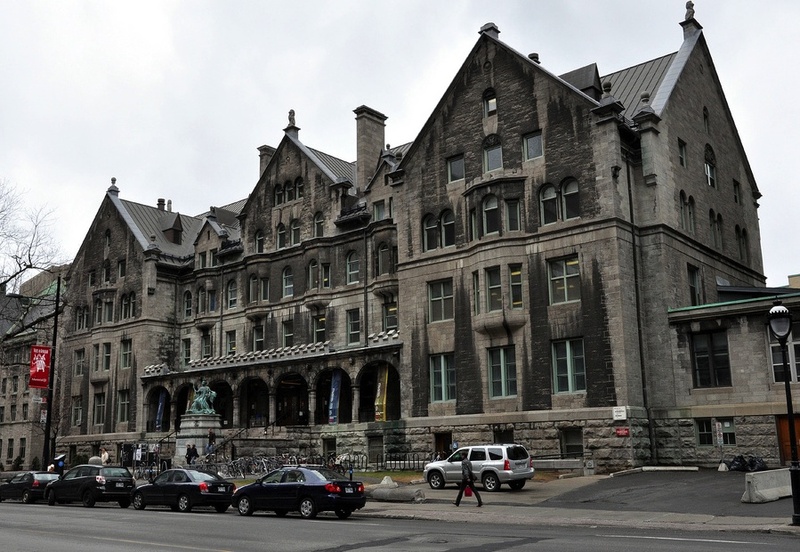 My overall take is that McGill features its program’s reputation as an institution in Montreal while UQAM partially drills down into students’ role in the university and its neighborhood on the east edge of downtown, and then bounds out around the world by featuring graduates and programs making a global contribution. To generally paraphrase their overall messages: McGill is saying: “This is the place to be in Canada for higher learning” and UQAM is saying, “Enjoy your time here and prepare to go out and change the world”. Itemized differences are not outstanding. Both have active communities on Twitter, LinkedIn, and Instagram, as well as deep catalogues of podcasts and blogs. UQAM marketing and students don’t seem to utilize Facebook (posts come once a month) or Google+ (no posts yet in ’14) as much as McGill, but UQAM is more active on YouTube and Instagram. UQAM carries a more visual presence in social media that mirrors the flair of its campus which often features entire sides of its tall buildings animated with artistic light displays at night. My perception of the French people in Montreal is also that they are a colorful and passionate group, so it makes sense that Instagram and YouTube drive most of the university’s social media posts and responses between students and staff or digital community managers. Those images and videos often feature students’ involvement in the campus neighborhood downtown. Students are seen on the streets, on the metro, and in the neighborhood. Just as we see a lot of Montréal, we see a lot of the world. A major social media campaign UQAM is currently running is titled “Think, Process, Reinvent”. This is a series of videos featuring graduates explaining how they’re using their degree to contribute to society in Montréal, greater Québec, and around the world. It feels like they’re looking to the future with a wide-angle lense to tell UQAM’s graduates they can have an impact on the whole wide world out there. McGill’s social media presence is pervasive, strategically cross-connected, and professional. A majority of posts on Facebook, Google+, and Twitter are professionally produced articles or videos sharing stories of students telling why they chose McGill and featuring what others are accomplishing as students and graduates. Each school within McGill uses Facebook, Twitter and Google+ to invite students to attend events and special lectures. And when it’s time to communicate a major McGill message, you won’t miss it. McGill posts big news in all online arenas with links to the home web site where to primary announcement, video, or campaign lives. There’s cross-connectivity within UQAM’s content, but McGill has very professionally mapped and connected it content across all platforms to make very certain you see it, whatever platform you prefer. The hottest item today across all of McGill’s platforms is a lipdub video of McGill students and faculty singing and dancing to “Happy” by Pharrell Williams. It’s reporting thousands of views per day. This is particularly relevant because five years ago, UQAM produced a lipdub video of students singing “I Got a Feeling” by the Black Eyed Peas which now has more than ten-million views. Both universities understand the power of a viral video in marketing their brands. The viral videos underline how similar these social media strategies can be. Despite core communications being in different languages, at the heart of the matter we have two elite universities engaging its students and continually showing the world, and prospective students, that each deserves a serious look. * There are two other primary universities in Montreal, Concordia University (English) and the University of Montreal (French). Both are very strong academically, I simply needed to narrow my list to two for the sake of comparison. ** I’ve been asked to point out differences I perceived. I’m not trying to make enemies. Scott, your post this week gave me a clear sense of differences between the two schools. The images you used helped to convey their distinguishing characteristics. While they both are using social media to support their academic goals they clearly have different environments. One having a formal educational twist while the other being more active, and modern in their approach to communication and education. You also provided a brief glimpse into the culture of Montreal which I found fascinating. Thanks for sharing a brief picture of the difference between local culture. Thanks, I’m using every opportunity to share a little of the culture we’re living up here. Glad that came across! Great post! I am working in higher education and I find your findings very interesting but at the same time not really surprising. It appears to me that schools already set the “tone” through their online presence these days. The internet is the number one source for parents, students and educators to research certain institutions and decide whether to apply or not. In my opinion, their social media activity (or lack thereof) is one step in positioning themselves among the copious amount of other schools, trying to convince future students to spend their time and money with them. Thanks, Peter, for adding your perspective. Your words reiterate two things: 1). The social media plan needs to be one part of a larger marketing effort, and 2) colleges need to be where kids are today – On their smartphones – to be visible. Hi Scott, great post! I found it particularly interesting because I am fascinated by how colleges and universities choose to market themselves and what they choose to highlight. Without prior knowledge of these two schools, based on your post I would guess that McGill is more traditional, more of the established, “old-guard,” while UQAM has a younger voice. I am making this guess based on the photos you provided, but also I think their particular uses of social media might be telling — you say UQAM is more focused on Youtube and Instagram, two of the most popular platforms for younger people. Great post!